Festivals and road tripping go hand in hand, and when it comes to having a next-level fest experience, the journey is just as important as the destination. If you’re hitting the road this festival season, we’ve pinpointed major festival hubs around the US and Canada and curated some helpful travel tips to help you live it up on the road. In this edition, we’ll review tips and travel hacks for road trippers hitting up music festivals in Toronto, Ottawa, and Winnipeg. Looking for things to do while exploring the Great White North this festival season? 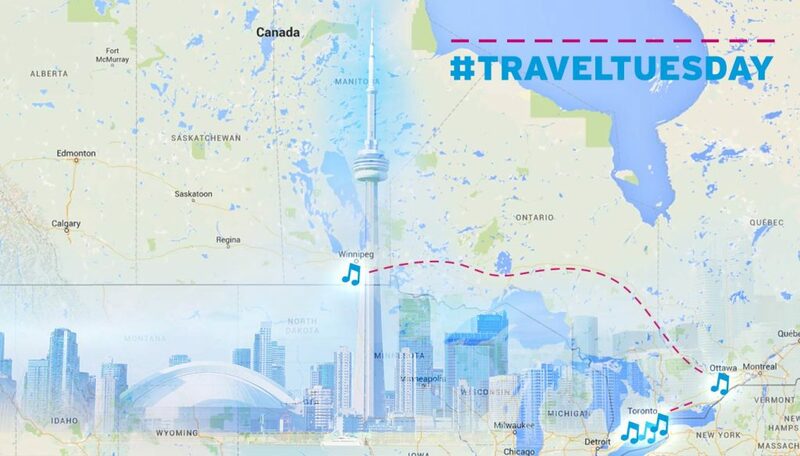 You could call the country’s official phone number 1-800-O-Canada (no joke)—or you could just consult our handy road trip guide for tips on what to see, do, and eat while making the festival rounds in the land of the CN Tower, hockey, and poutine. Check out our recommendations below and get ready to do some road tripping in true Canuck style. Toronto is one of the safest and most diverse cities in the world, meaning you can enjoy all the perks of multicultural urban life without any pesky big city crime troubles. In addition to its gleaming skyline and cosmopolitan array of art and music venues, the city boasts lively ethnic enclaves and famously friendly residents that make it a perfect place to soak up some culture. Whether you’re doing dim sum in Chinatown, perusing Pakistani fabrics in Bazaar, or slurping down soon tofu in Koreatown, you’re in for a serious feast of the senses. If you’re looking to keep it completely Canadian, the 2016 CBC Music Festival is your jam with an all-Canadian lineup of homegrown heroes like Hey Rosetta!, Tanya Tagaq, Whitehorse, Meastro, and Zika Ibrahim. The fest is held at Echo Beach, a gorgeous waterfront venue in downtown with a sandy beach and unbeatable city views. For a bit of Toronto history while in town, stop by Casa Loma for a tour of the Gothic Revival style mansion and gardens before indulging in a throwback meal at local culinary institution The Senator. This year’s Digital Dreams lineup is looking pretty ace: Above & Beyond, Armin van Buuren, and Axwell Ingrosso have all signed on for the holiday weekend dance party at The Flats at Ontario Place. And that’s just As! Imagine all the killer acts starting with other letters that will be bringing the bass this year. Toronto is gorgeous in July—don’t miss the panoramic views from the CN Tower, the impeccable collection at the Art Gallery of Ontario, and all the action at the Hockey Hall of Fame. Once you’ve worked up an appetite, hit the colorful streets of Chinatown for a dim sum spree at local favorite Lai Wah Heen. Also held in Toronto in July, VELD Music Festival heats up at the end of the month on the expansive greens of Downview Park with sets by The Chainsmokers, Deadma5, Flume, Steve Aoki, Martin Garrix, and many more. If you’re planning on making the 1.5 hour drive to see Niagara Falls while in the area, fuel up for the journey with some soul-satisfying tandoori at the Lahore Tikka House, located in the Bazaar neighborhood near downtown. Bazaar is also home to one of the largest South Asian marketplaces in the world, and its dizzying display of Indian, Pakistani, Afghan, Bangladeshi, and Sri Lankan wares is worth the trip on its own. The Canadian Capital has bucked its identity as a staid government hub in recent years with a proliferation of world-class restaurants, hip boutiques, and cutting-edge tech startups. If you’re road-weary from your trip, you’ll love how walkable the city is—you can tour the surprisingly accessible government buildings on Parliament Hill, enjoy breathtaking views of the Ottawa River from Major’s Hill Park, and hit up the cute shops of ByWard Market all without breaking a sweat. Ottawa Bluesfest takes over the riverfront at Lebreton Flats every year for a massive 10-day celebration of blues, rock, pop, hip hop, and beyond. This year’s lineup is seriously insane—Billy Idol, Joe Jackson, Earl Sweatshirt, Future, Brad Paisley, Bryan Ferry, Duran Duran, and the Red Hot Chili Peppers are just a few of the amazing acts heading up the bill. The Ottawa River beckons just beyond the festival grounds—head to the Paddle Shack to rent a canoe or kayak for exploring the flat-water basin, which offers gorgeous views of the city and its lush natural surroundings. After you put in, head for a briny taste of Canada’s legendary Prince Edward Island oysters at Métropolitain Brasserie. Known as the “Gateway to the West”, this central Canadian regional capital is a city on the rise thanks to its gleaming modern museums and solid sports scene (the NHL Jets recently returned to Winnipeg after spending 12 years in Atlanta). Winnipeg is c-c-cold in the winter, but its beautiful summer weather is perfect for strolling the interesting shops of Osborne Village and enjoying the city’s four major rivers (the Red, Assiniboine, Seine, and La Salle). Road trippers looking to rest their heads can find a reasonable room in the heart of the city at Inn at the Forks. This summer folk fest favorite features the best in roots, bluegrass, indie folk, Celtic, Americana, and beyond with an eclectic lineup that includes international acts alongside local talent. The 2016 event promises another year of great music with performances by Ryan Adams, Lord Huron, Milky Chance, Sam Roberts Band, and Alan Doyle and the Beautiful Gypsies. While in town, don’t miss the Canadian Museum for Human Rights, a stunning glass and steel homage to Canada’s Charter of Rights and Freedoms. For good food that won’t violate your right to an affordable meal, head for creative comfort fare at The Tallest Poppy. Heading to a festival in the US? Check out our road trip fest guides for the West and East.